I'm in Toronto and looking for good quality acrylic, cotton, blends that do not contain wool. Romni is 90% wool and generally doesn't sell acrylic and Michael's and Walmart generally sell the cheapest scratchiest yarns. Does anyone know of a shop that has a good selection in store? I'd be happy to shop online, but worry about additional charges after shipping and not actually being able to see the yarn. I've finally found the ideal project for me - snowflakes! They take about 20 minutes each which is about the length of my attention. I only took one picture (of the first one) but I will add more pics as I finish more snowflakes. I used a pattern off ravelry found herehttp://www.ravelry.com/patterns/library/birthday-earrings. Thanks for looking and happy holidays! I'm taking small victories tonight! Today was red & white day at dd's school (Valentines Day, Olympics, and Chinese News Years celebration). And you know what my daughter does not own one red or white piece of clothing! I couldn't believe it. So I whipped up this red and white fantastical flower for her to wear to get in the spirit. She loved it and wore it all day which is the biggest thanks I could get! She actually asked me what kind of flower it is. So cute! And here she is modelling it. I can't find it right now to get a close up pic, but I modified the Bobbles in Daisy pattern in Adorable Crochet. I know these are a bit simple to be posting, but I made SO MANY of them and had so much fun with my dd making them I wanted to share. The funny thing is I didn't get any pictures of the final product. I hope this inspires a lurker to just do it! I bought tissue hearts at the dollar store. Folded plain 8 1/2 x 11 in 4 then in half and cut out half a heart around the seem. Glued the white heart to the tissue then let them dry. The picture is of them drying. I didn't realise it was going to take so long or that the red colour from the tissue paper would come through the white paper. Then I wrote Happy Valentines Day From Zoe on each one and she put the stickers on. There are 36 of them. Like I said never again...at least not the night before. I started this afghan after xmas. While I was on vacation I was doing really well averaging over 1 block a day, but have only done 1 since then. I was wondering if anyone else would be interested in trying it out? I know it would inspire me to keep going and I'd love to inspire someone else to try this who might have passed on it thinking it would be too difficult, because it's not that hard! I look forward to seeing who is interested. I'm a slow knitter so it took me almost 2 hours to finish. I used 1 ball exactly. I did this by using 10 mm needles and following the pattern until I ran out of yarn. So that I would know how much yarn I would need to cast off I measured how much yarn 1 round would take and added a third. So for me it was 90 inches of yarn per round, I added 30 inches so I started casting off when I had 120 inches of yarn left. It's not quite long enough to wear as a hood, but if I am wearing my jacket I can certainly pull it up over my head for added warmth inside my jacket hood. And I can pull it down over my shoulders for more warmth, but it gets a bit stretched out when I do this. So I have finally finished something so I can post. I've been lurking so long that my few FO's are ages old and I'll have to find them. In the meantime I wanted to post something current. I admit I have been inspired by seeing so many of these that I had to put my sweater on hold for some instant gratification. The pink one I did first in acrylic which was easy, but the second one is cotton and I had to frog it a few times to get the circle to lie flat from the bottom. They are both just rounds and rounds of single crochet. 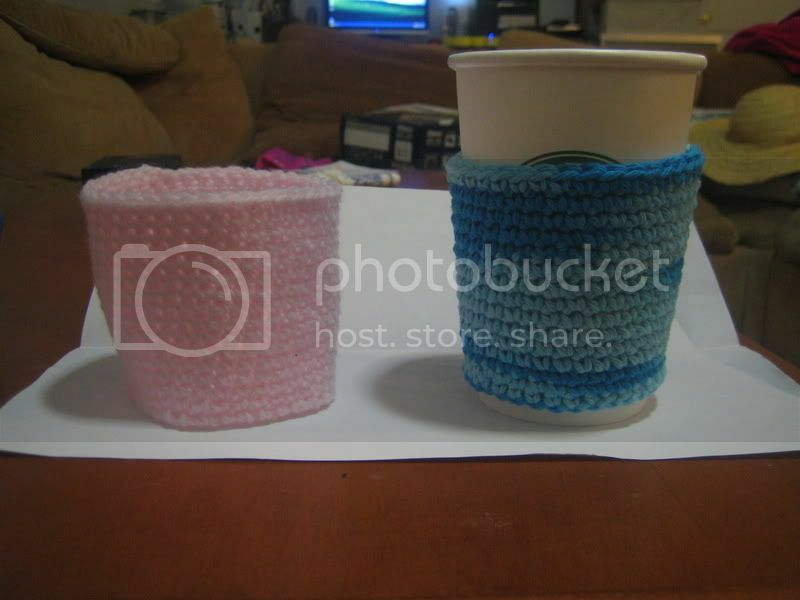 Oh and the pink one is wider because I made it for a cup from my local coffee shop. I plan to make a blue one for there too I just didn't have the yarn at the time. I've been reading a lot of posts and getting motivated to make something and since today is a bit cool I remembered I have fabric I can make a jacket for my 2 year old with. Anyway, I'm not sure which combination to use. The top pink is fleece and the other 2 are flannel that I thought I'd line it with. Which lining do you think would be better? Oh and can anyone suggest a pattern I might use? Originally I was thinking to wing it, but I haven't sewn much so a pattern might be a safer idea lol. I'm wondering if anyone has seen a pattern to make a sleeping bag for toddler size 18 mos+ like the ones for new born babies (I haven't seen patterns for this I just have seen them in the store, but they don't make them bigger than baby). The other thing I am looking for is a pattern for kids jammies, 2 piece with feet. I can find tons of one piece with feet or 2 piece without feet. It is thoroughly frustrating!